Here you can see the three Jack o’lanterns, the compass and the cat, the snowflakes, and the cactus (which I let Acorn steal from me, along with the compass). The anchors all around the bottom (seven of them!) are so his head doesn’t get lost in the clouds, says Acorn. 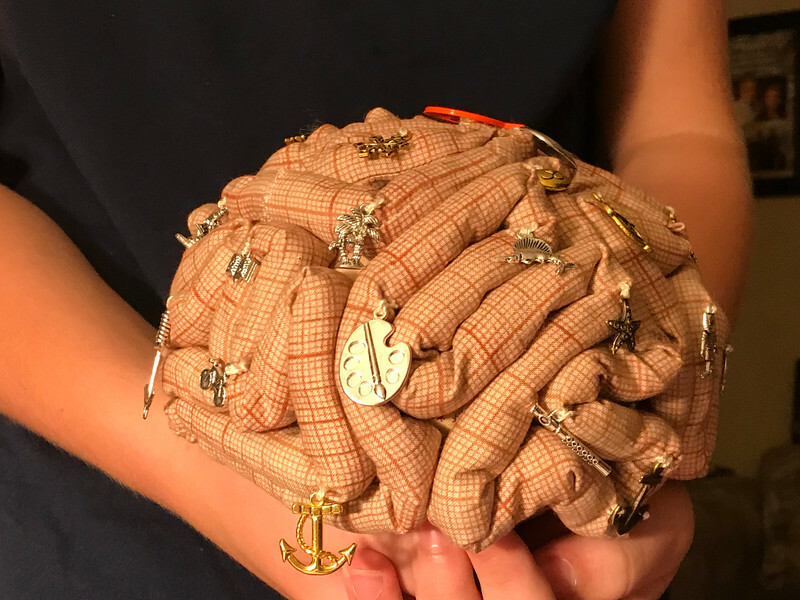 On Brain 2 (Acorn’s Brain). After a five-hour lawyer visit and lots of paperwork (plus homework, always homework) and no lunch, there was a tiny little knock on the door this afternoon. It was… the post office! Delivering a package to our door. I opened the box, moved aside a few things inside, and called Acorn. 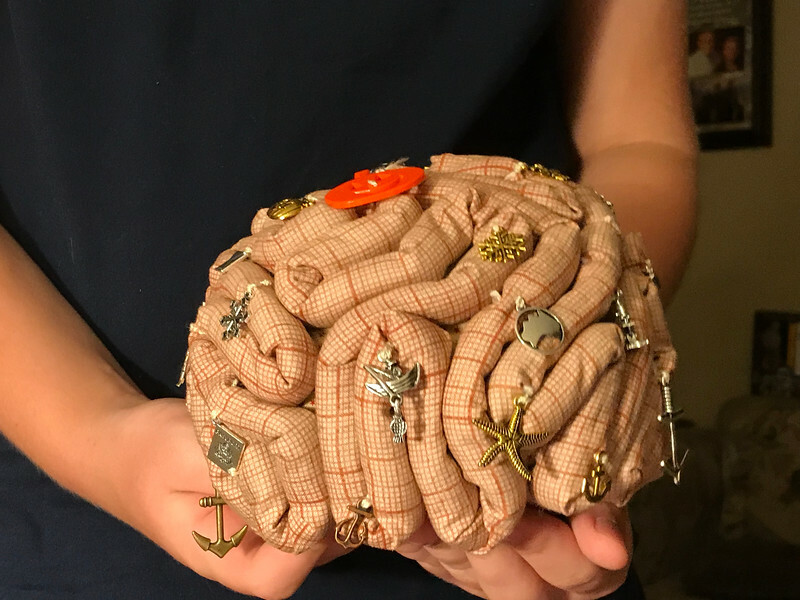 “Would you like to extract your own brain?” I asked him. 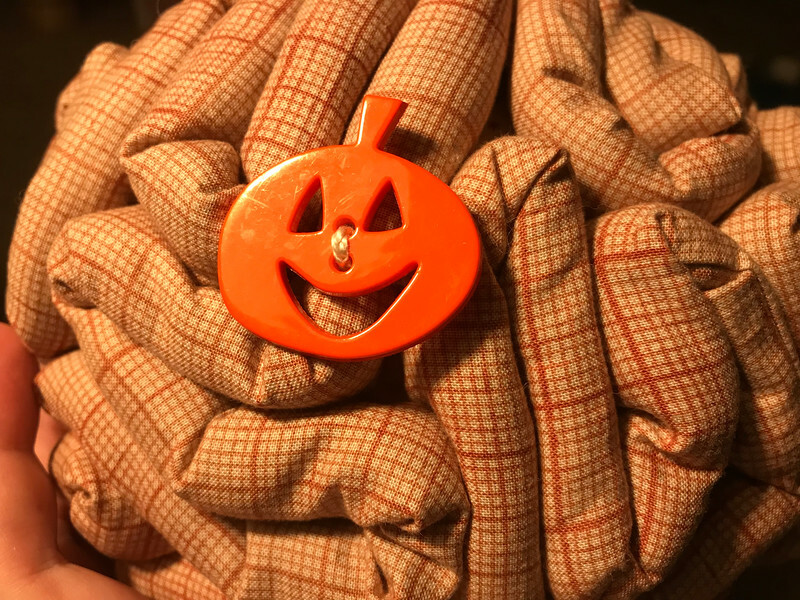 Sewing the charms on will start later. Right now, just having the brains is a sheer joy and pleasure, all by itself. Considering making September my craft-a-day month, a la what Laridian is doing with August. Showing progress counts, not just finished objects. Otherwise this is going nowhere for me. 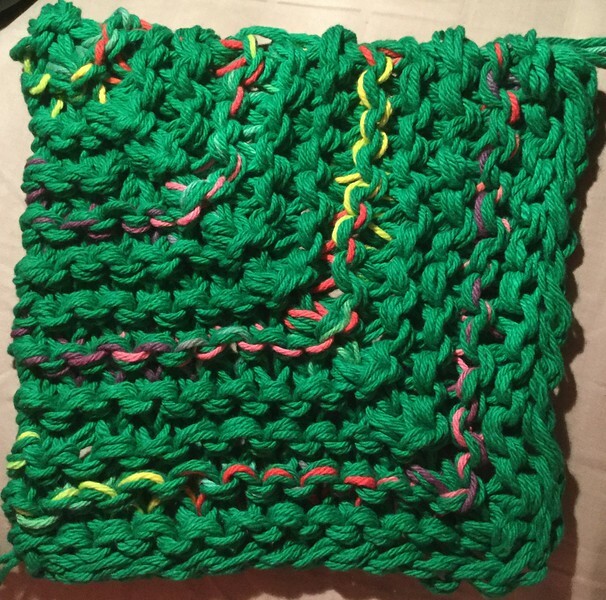 My knit blanket squares aren’t as visually interesting as her state quilt blocks, but they probably take as long to produce. Stretched, matted, framed. And cleaned of 42 years’ worth of dust. 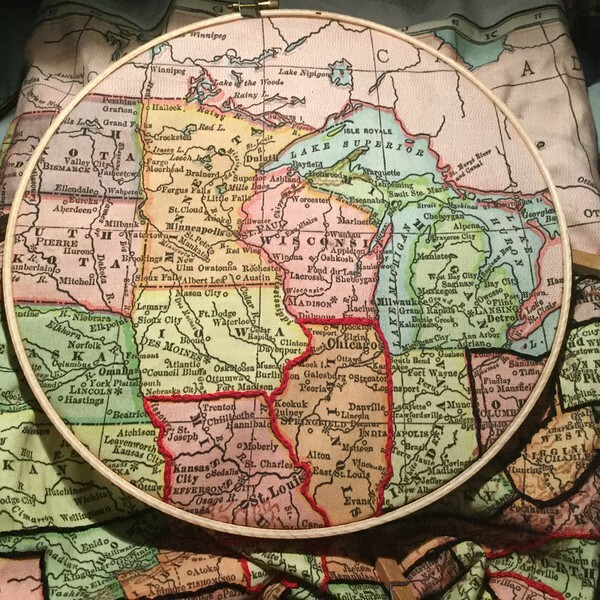 Now it’s behind shatter-resistant acrylic, so if some disaster were to strike and the “glass” broke, it’s very unlikely to harm the needlework. There’s extra space now at the top and bottom, above the butterfly and below the signature, and I think it makes a huge difference in the look of the piece — in the old one, it seemed sort of crowded into the frame, at least in the vertical dimension. Now, there’s plenty of white space, and then more white space provided by the matting. 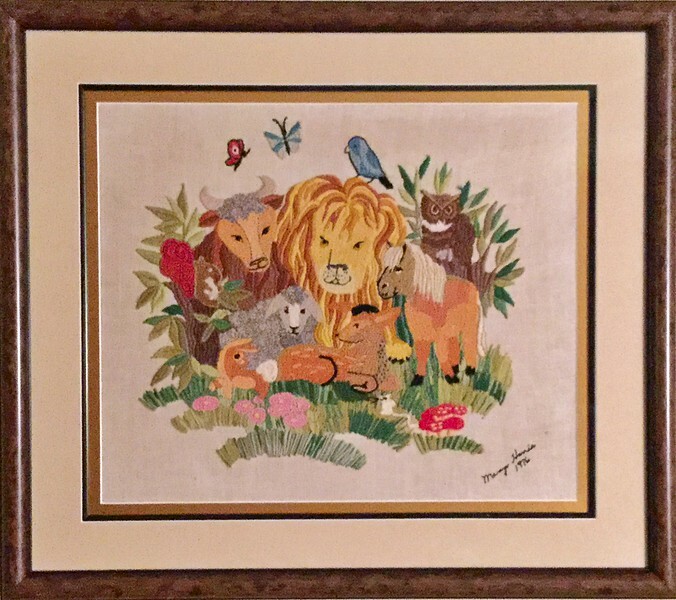 It really draws the eye in to the center, and the thin gold mat draws out the gold undertones in all the brown animals (not to mention the gold in the lion!). Mom and I are both very pleased. When I left off, I was about to remove the piece from the frame it had been in for the last 42 years. 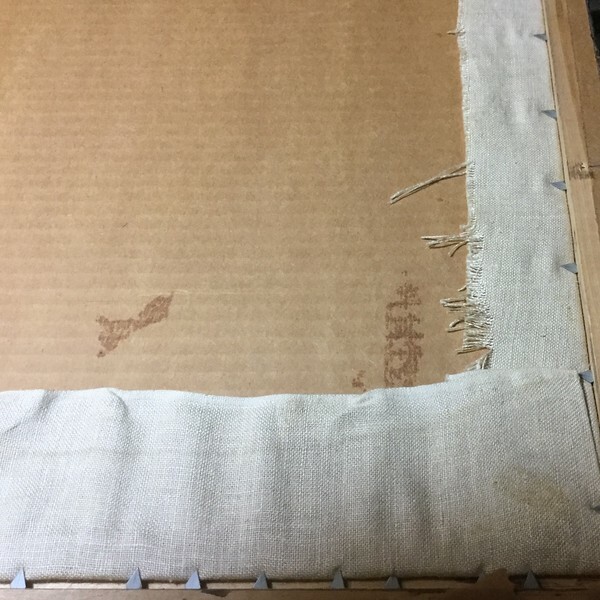 First I got through the layer of paper, then removed the fifty or so sharp little diamond-shaped metal teeth holding the cardboard backing in place. 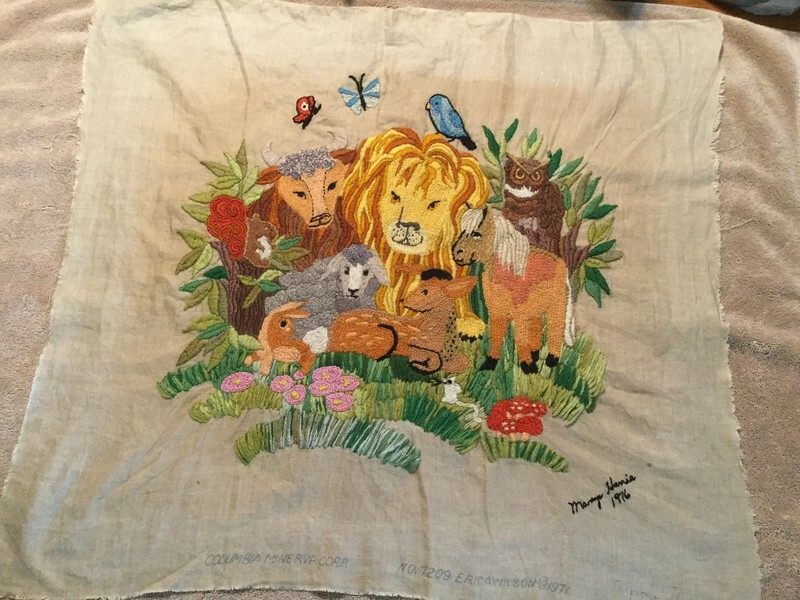 My next discovery was that Granny had been so unhappy with the piece with she finished it, not only did she not press it, she didn’t even bother hemming it. Which probably means that part of the color change is irreversible. Mom held it up so I could get a pic of the copyright info. I haven’t looked up anything about the company that produced the design or anything yet, but it’s interesting to know. 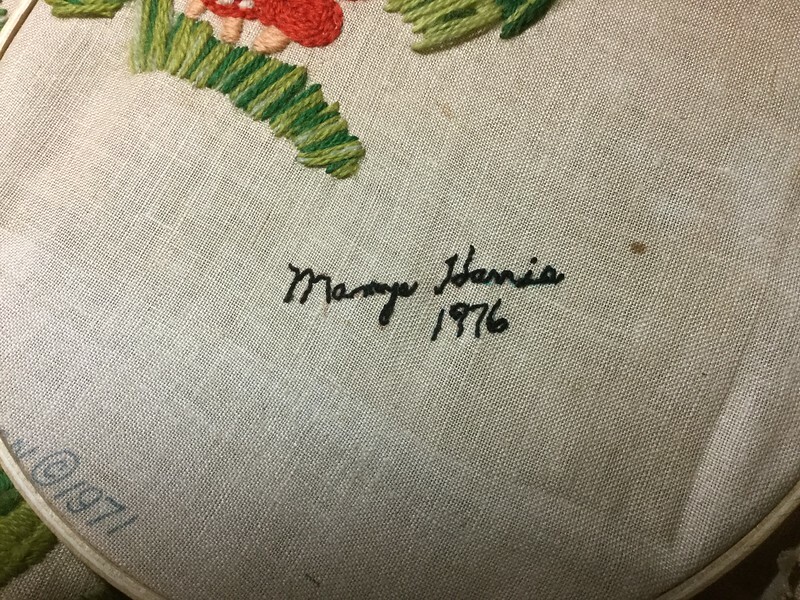 Once the piece was out of the frame, I got to work and embroidered over Granny’s signature and the date. 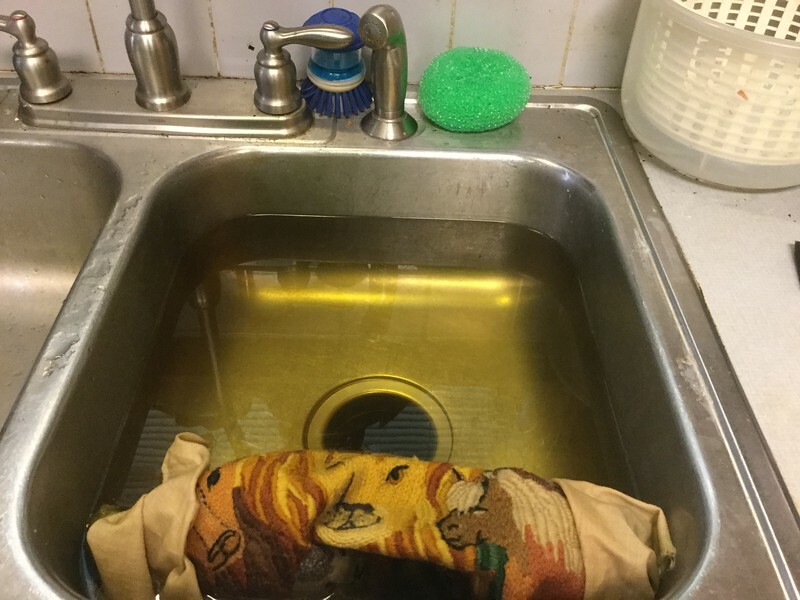 That done, I washed it, following more or less the same procedure I would for washing handknit wool (though not the same kind of soap, since I suspect the linen wouldn’t appreciate having lanolin added). And now it’s laid out to dry on the kitchen table. 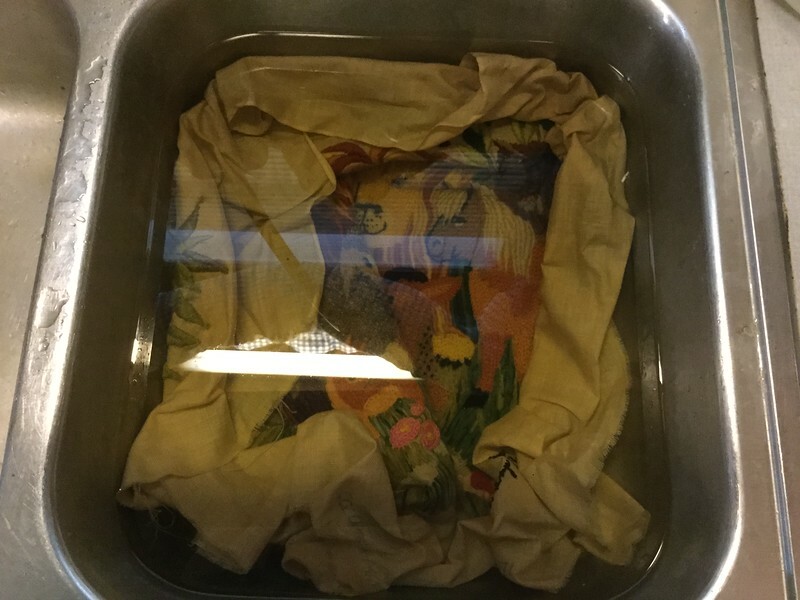 The fabric that’s been visible all these years (and some of the fabric that hasn’t been) is still discolored (and if you think additional washing would take care of that, speak up quickly! 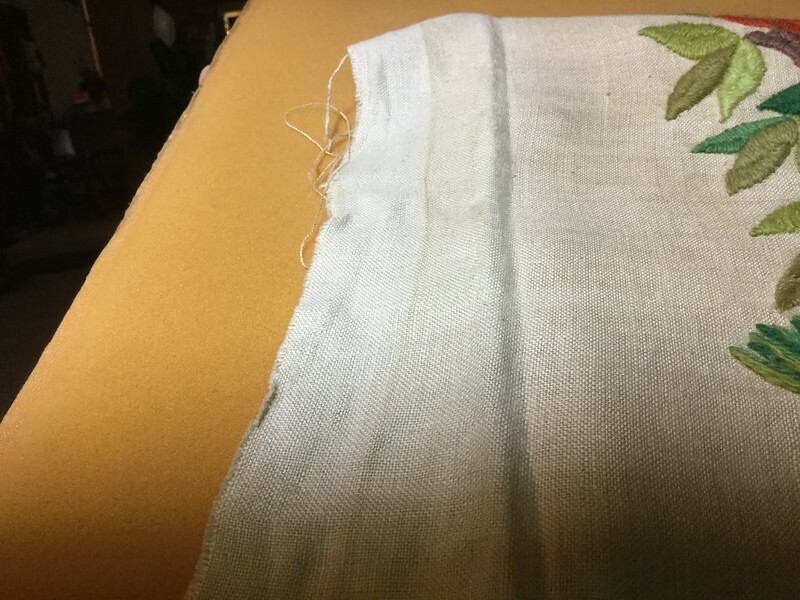 At the moment I’m working on the theory that it’s linen and has discolored with age and exposure to air and light), but the threads are vivid. The lion looks particularly stunning. Next up: pressing, then taking it for framing. 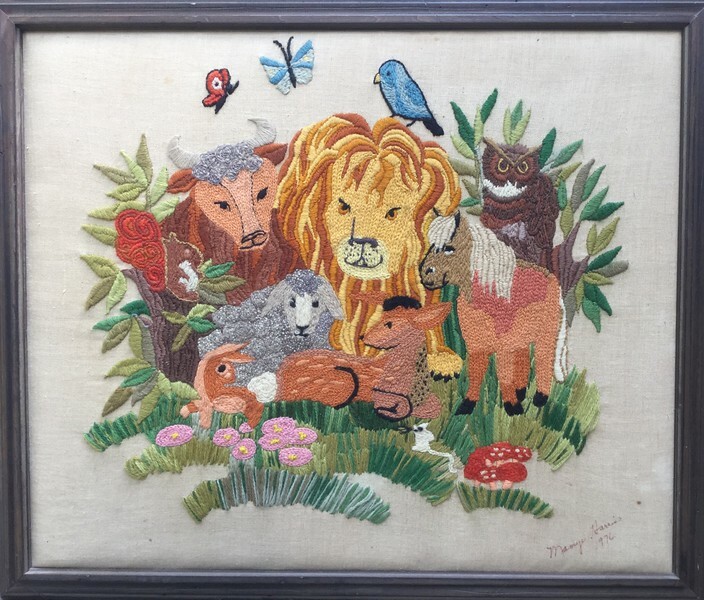 My grandmother made a lovely piece of crewelwork titled Peaceable Kingdom in 1976 as a gift for my mother, wasn’t happy with how it turned out, and wadded it up and sent it in an envelope through the mail, utterly uninsured(! ), to my mother. My father then took it and, as a surprise, had it mounted and framed. 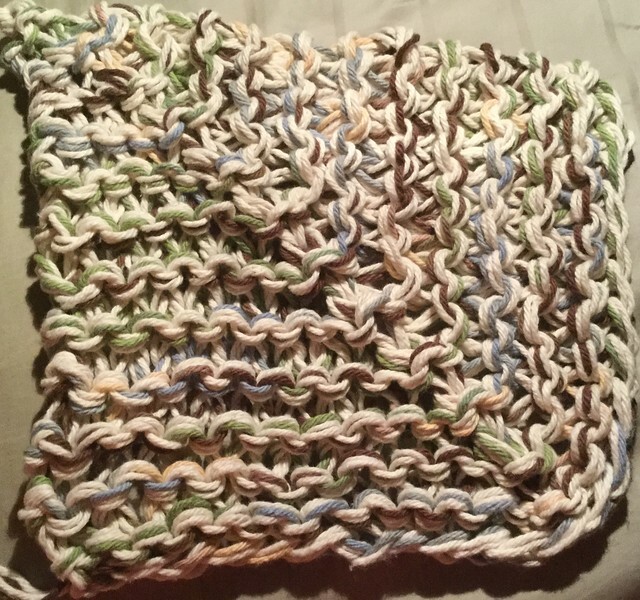 (Granny decided she liked how it had turned out after all, once she saw it in the frame.) It’s in excellent shape still, except that it’s not behind glass, and has had 42 years to collect dust. So as a gift to Mom, I’m taking on the nervewracking task of cleaning it. 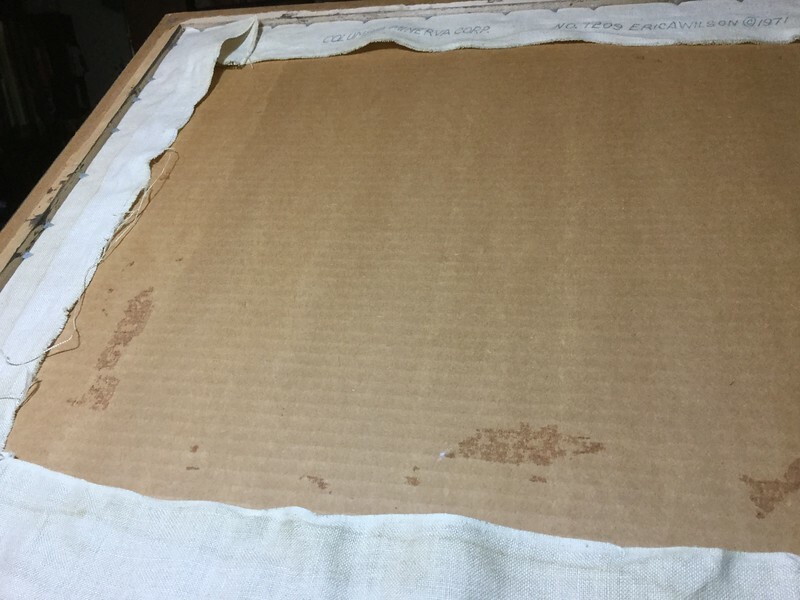 We already priced having it reframed and placed under glass, so that this won’t come up again, so she’s aware of what that will cost… and the cost will be significantly reduced if I can have it ready before Tuesday. 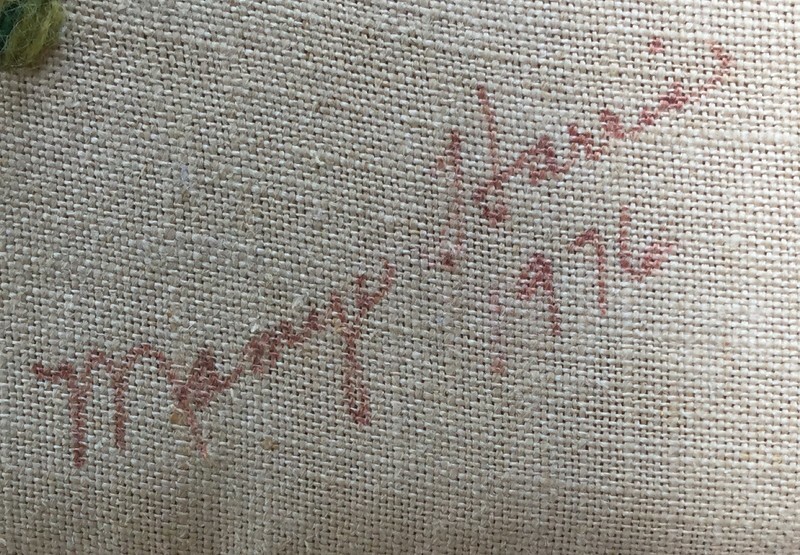 My first task after removing it from the frame will be to embroider over my grandmother’s signature. It’s only signed in ink of some sort, and we very much fear it would wash away if not reinforced. 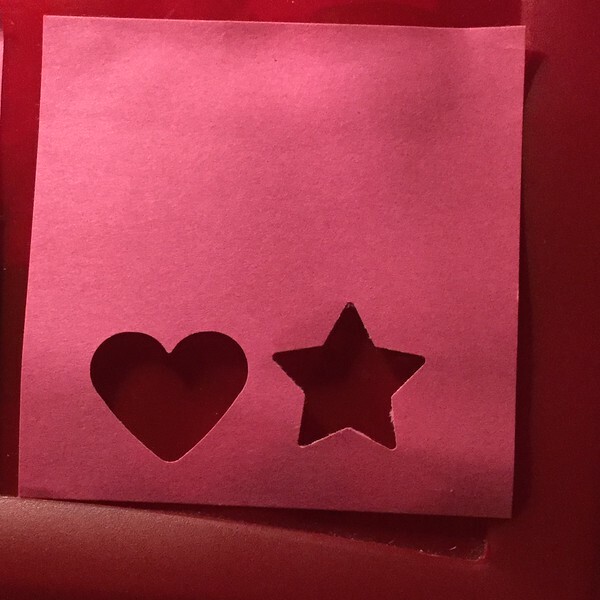 Along with the blue heart for Home, my mother, and one of my sisters, we now have a yellow star for Acorn’s other grandparents, a pink star for one of my brothers (because no one knows what his favorite color is and pink was the only color I hadn’t already used nearby), and a green heart down in Houston for Laridian. My first Father’s Day without a father. …Time to bury my feelings in a little crafting. 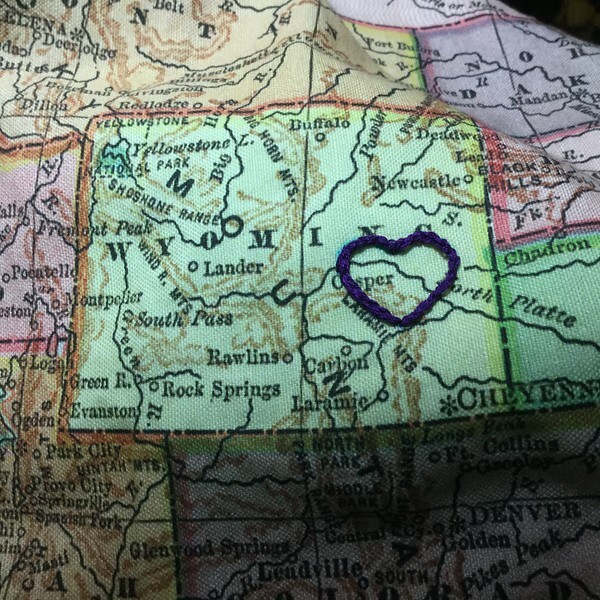 Let’s start embellishing the map to show where loved ones live! 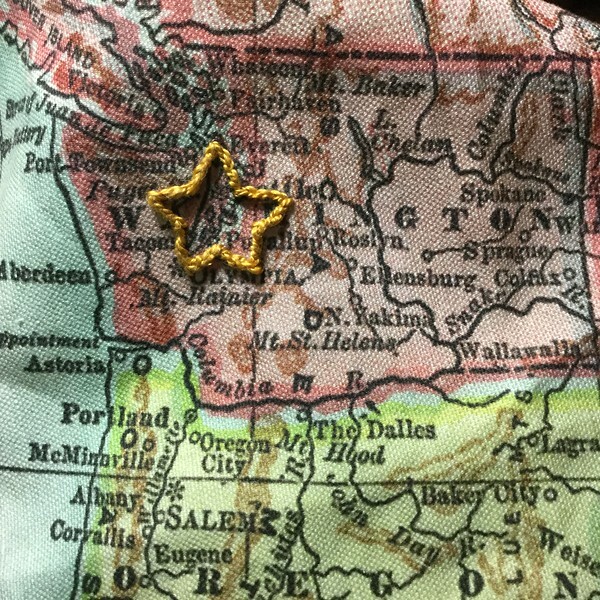 My sister in WA gets a gold star. 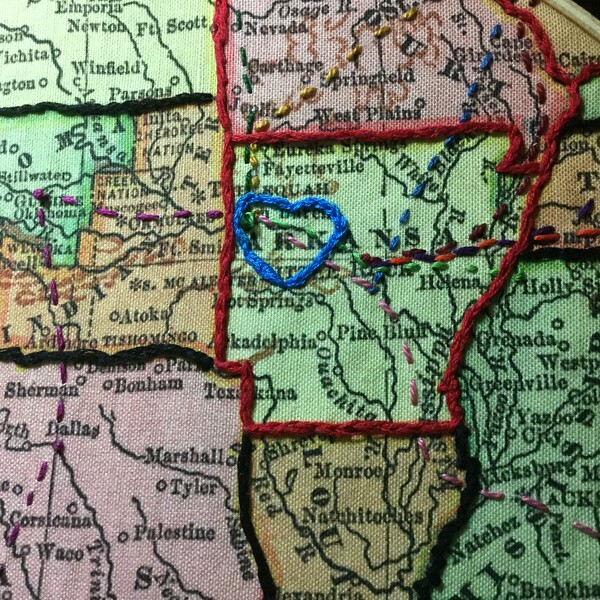 And a blue heart for home, my mother, and my other sister. 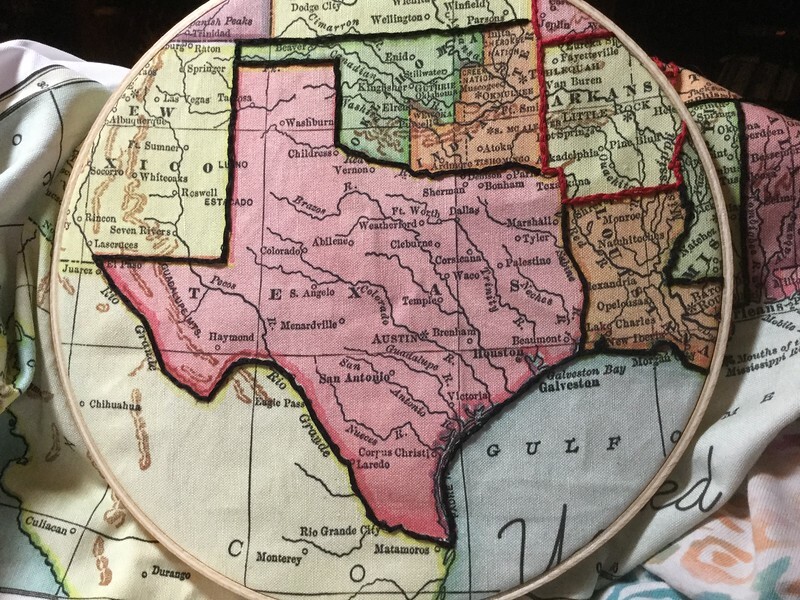 I’m trying to use people’s favorite colors and my mother and sister would both have chosen red, but that would have clashed with the state border. We ended up with bright blue because (a) it contrasted harmoniously with everything already going on in the area and (b) what the heck, blue is my own favorite color anyway. 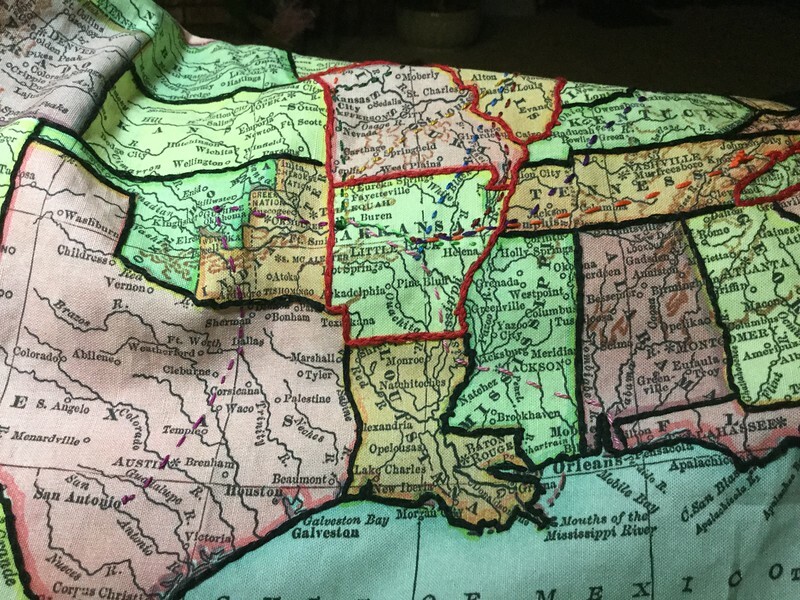 Now complete: the Mississippi trip (bright green, from NW AR to NW MS) and the San Antonio trip (middling purple, Arkansas to Guthrie, OK then to Dallas and finally to San Antonio). First, a couple of purchases to support this project. I bought two paper stamps, the sort usually used for scrapbooking, to use as stencils on the map. I also realized I needed about six more colors if all the road trips were going to be in different colors. And my ring of bobbins was getting awfully full, so I paid $3 for a box to hold my bobbins. 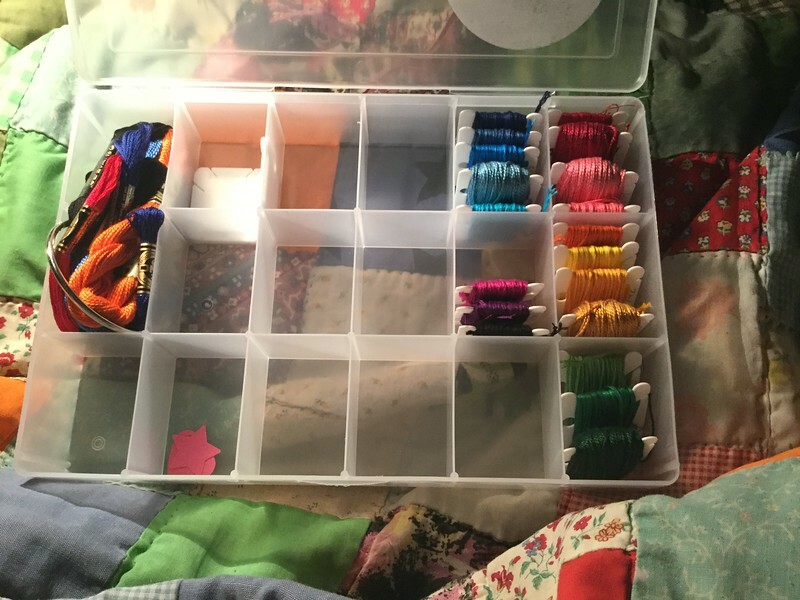 Yay, my embroidery floss is organized! And what you’re really here for: the current status of the map. All those little bird tracks across the Midwest! And more to come. 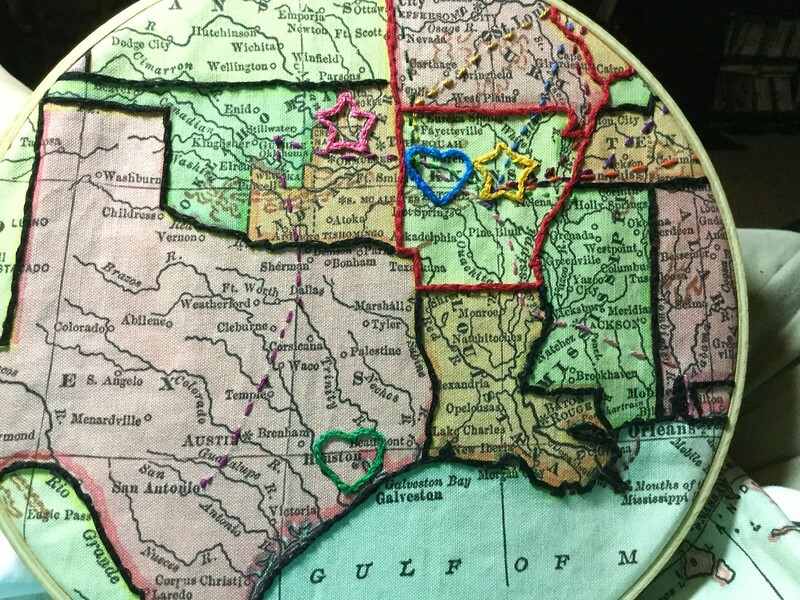 To be followed by the hearts and stars (showing where loved ones live) and then by French knots all over the place to indicate cities we’ve visited (listed in the previous post). A trip to near (but not in) DC when Acorn was very small indeed — need to find out exactly where this was! *Cotham's in Scott, AR which is no longer there, the Plantation Museum which is at Scott and the Toltec Mounds which is out in the Scott/Keo area of AR. Petit Jean. Sugar Loaf? Diamond mine, twice. Hot Springs. * driven from Durham to DC, up the I-85/95 corridor, and had lunch in Richmond, I believe. He's also traveled to Baltimore, MD. (aquarium, mostly), and the air and space museum in Herndon, VA.
* flown to Orlando, Florida, and traveled within Florida to Disney World, The Kennedy Space Center (at Cape Canaveral), through Tampa (had a meal there) and along the coast from St. Petersburg up to about Tarpon Springs. A week in MS — don’t remember where exactly, my brother might know. I was doing a favor for his friend. Acorn was very small, but he was a good traveler! 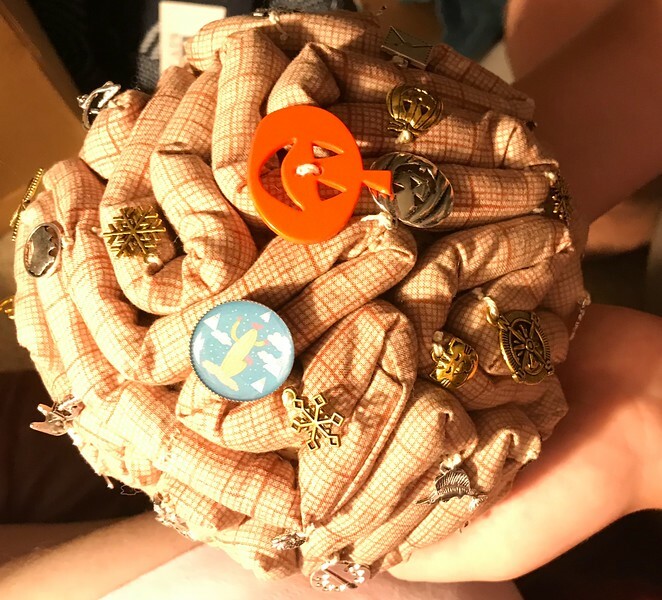 knot if I can discover the city. * Durham to Boone (and Tweetsie Railroad park), Asheville, Mt. Airy, Greensboro, Hillsborough, Wilmington (along 40), Topsail Island, Carolina Beach, Emerald Island, Kure Beach, the Outer Banks. He's been to the aquariums at Fort Fisher, and Pine Knoll Shores, and in Tampa, FL and Baltimore, MD. Showing road trips to Pittsburgh for my sister’s graduation, to Ohio to study languages for a summer in college, and within Ohio for a weekend because that program was mega stressful and we needed a break. 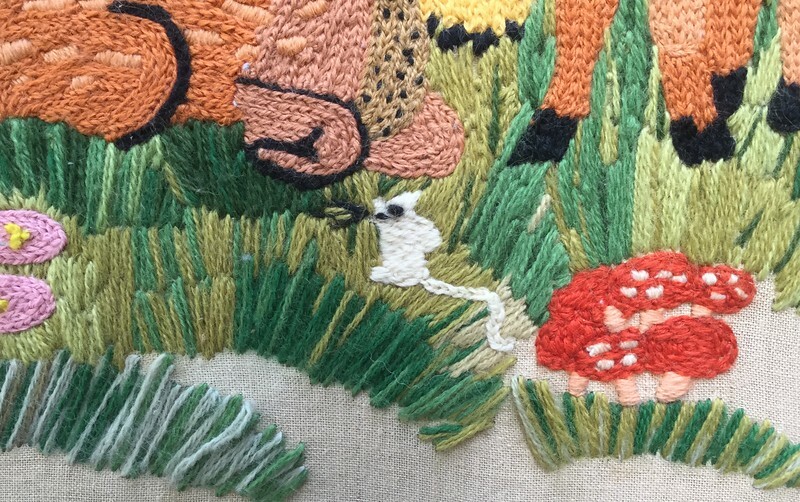 And with that, I’ve gone from “I never embroidered anything” to “I made this” in one week. All states Acorn or I have visited (not including drive-throughs) are outlined. 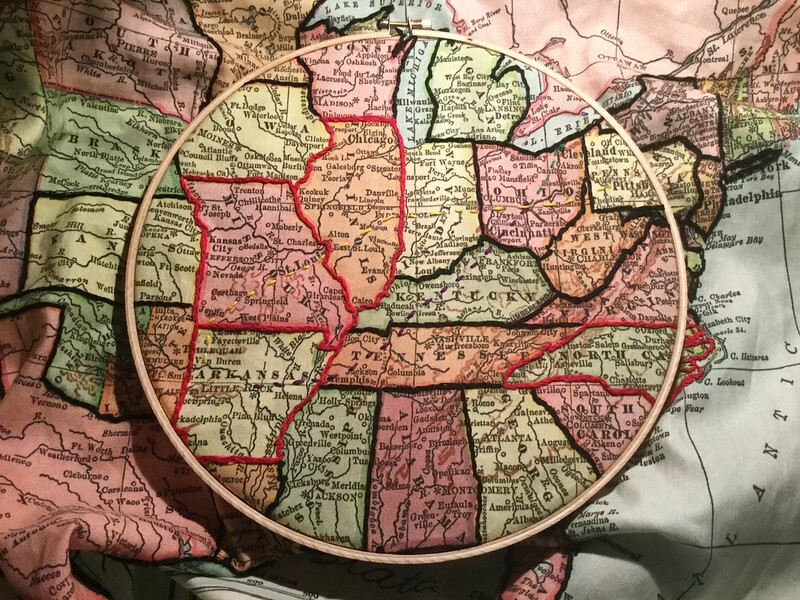 After this, I’ll be embellishing the map to show cities we’ve visited, road trips taken, and where loved ones live. 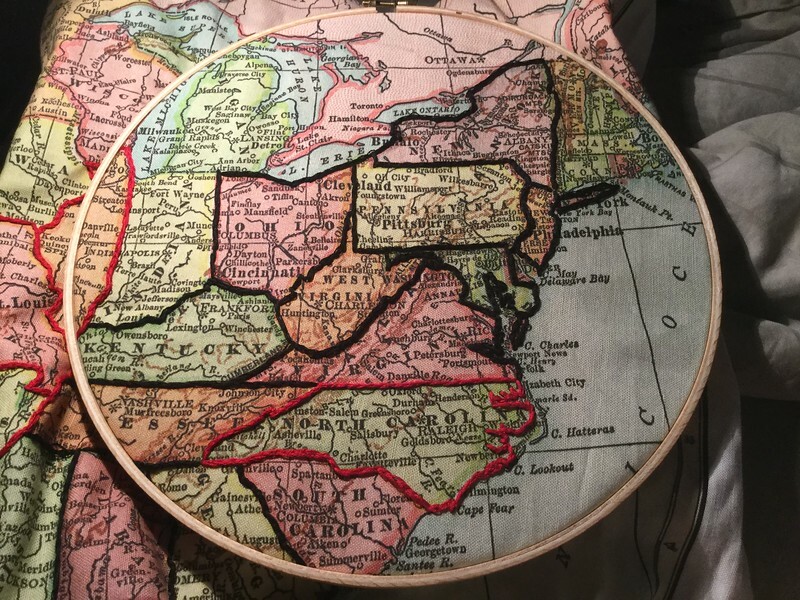 Above are pictured the last four states I need to outline! After that, it’s all embellishments. 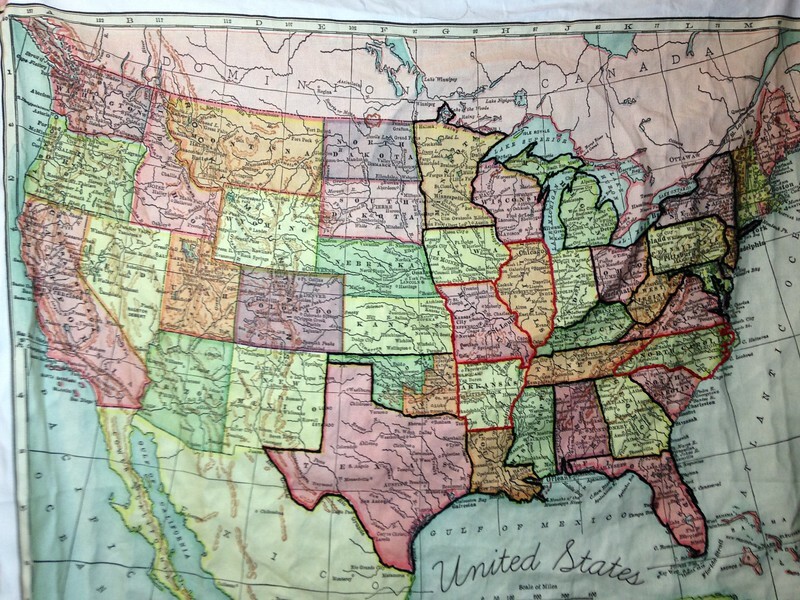 All but one of the states shown are states Acorn and I have both been to, but at separate times. 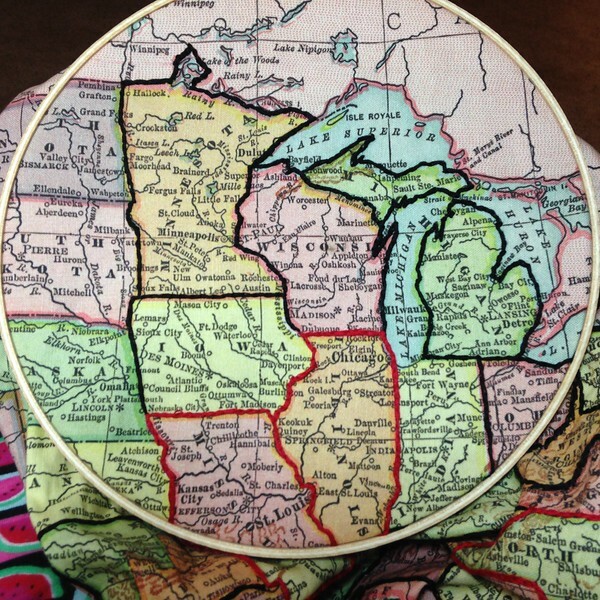 ETA: I think two more hoops’ worth of embroidery will see all the states outlined that need to be. Then, it’s on to the embellishments! Bedtime update! 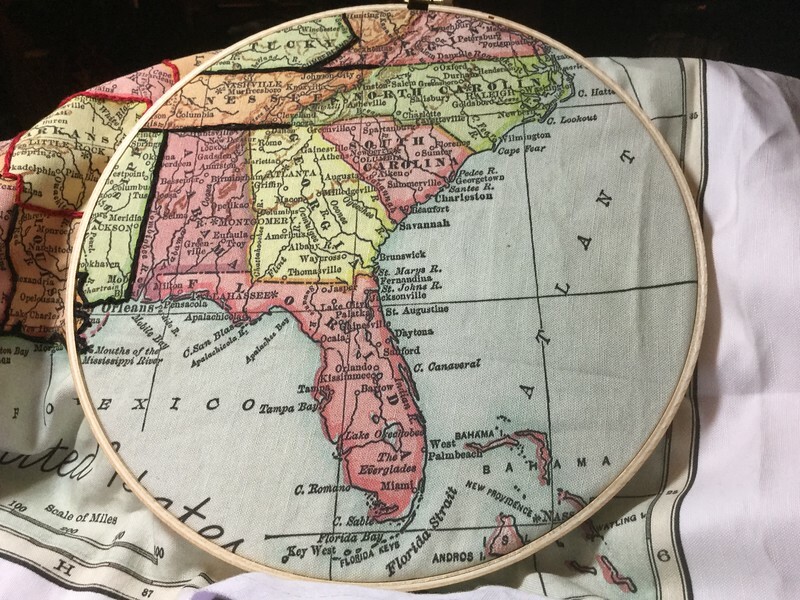 I had to move the hoop while I was working today and it was time to move it again when I called it quits, so I had Acorn hold the map up so I could get a picture of the entire area I’ve done so far. I’m glad I’m doing these daily updates so I can see how fast I really am working! 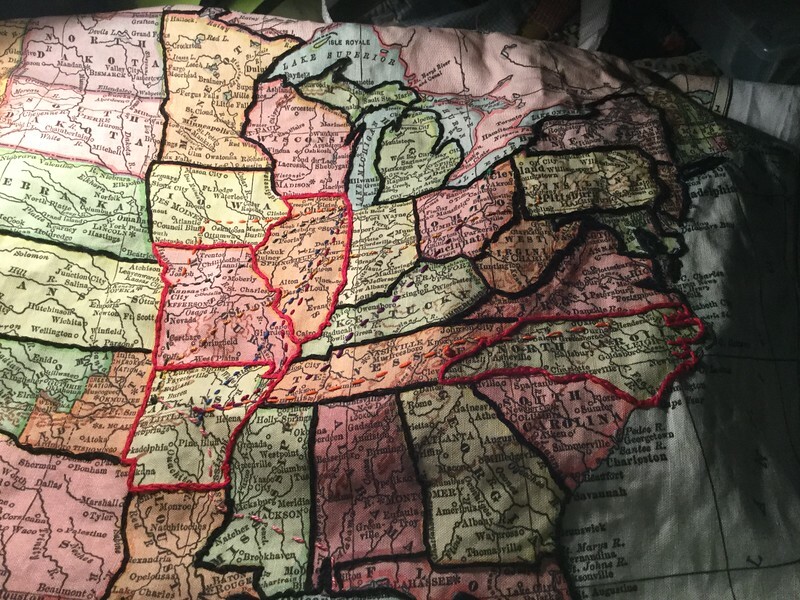 Today I added Tennessee (minus its east border because that’s the west border of NC, and will be red), Kentucky, Louisiana, and Oklahoma. 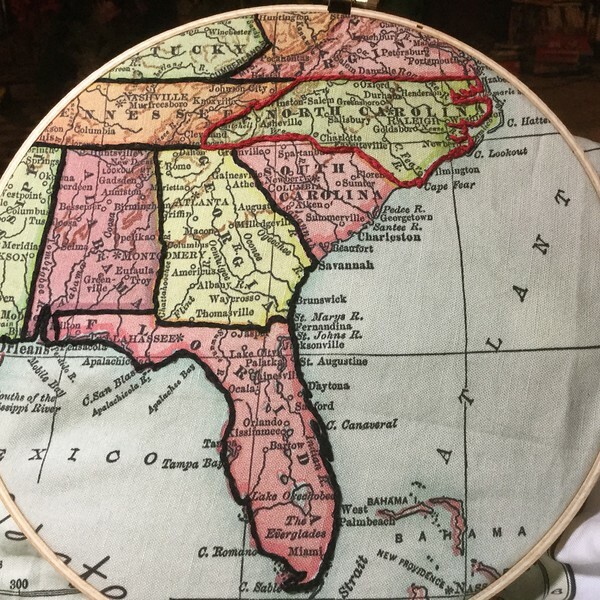 Tomorrow I’ll probably start with Texas to finish the Southwest, then head east along the coast and see how far I get with the trio of AL, GA, and FL. In other news, I’ve figured out that our next trip should be to West Virginia. Why? 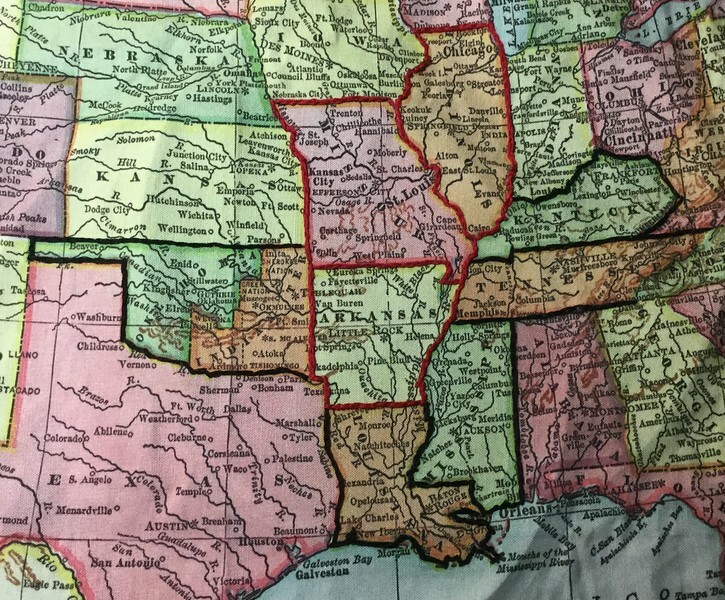 Well, you’re not going to be able to tell we haven’t visited it by looking at the map, because we’ve visited all the bordering states, and it’s landlocked. To fail to visit it seems dishonorable!